Ten Questions to Evaluate Your Environmental Consultant’s Competence (Quiz Them). Ever-increasingly complex technologies, regulations, and requirements burden each of us to become legal and technical experts in almost everything to keep from getting burned in everyday transactions. This simply isn’t practical or possible. You should partner with only exceptionally experienced, licensed, and appropriately insured environmental professionals. Incompetence is perhaps the worst form of corruption. Is there any way you can be reasonably certain the environmental consultant inspecting your property is truly an “environmental professional?” Yes, there is. Anyone representing themselves as an environmental professional as defined and required by ASTM E1527-13 Standard Practice for Environmental Site Assessments: Phase I Environmental Site Assessment Process (November 2013) should easily be able to answer the ten simple questions below without consulting others or any resources. 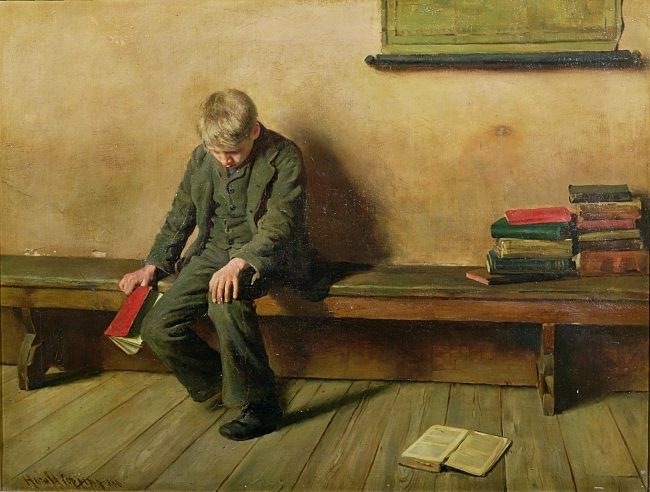 The Dunce, 1886, Copping, Harold (1863-1932)/© Used with Permission by Russell-Coates Art Gallery and Museum, Bournemouth, UK/The Bridgeman Art Gallery. Question #1: What years were the Comprehensive Environmental Response, Compensation, and Liability ACT (CERCLA) and Superfund Amendments and Reauthorization Act (SARA) passed and what were their implications for commercial real estate lenders and mortgage holders? It’s remarkable how many “environmental professionals” can’t answer this question. If your consultant is unable to answer this one, they will be inspecting your property but not really understand why. Scary stuff, eh? CERCLA was penned into law by President Carter in 1980. Among other things, the law created a tax on the chemical and petroleum industries and granted the federal government broad authority to respond to hazardous substance releases and uncontrolled hazardous waste sites. Over several years, the taxes collected went to a trust fund for cleaning up abandoned or uncontrolled hazardous waste sites. Most importantly, CERCLA provided (in a limited way) for liability of the persons or commercial entities responsible for the hazardous substances releases at these contaminated sites. However, CERCLA had a gaping loophole (the “secured creditor exemption”) that permitted commercial lenders (banks and other mortgage holders) to “slip through the liability noose” associated with the investigation and remediation of abandoned hazardous waste sites. This proved financially problematic for the federal government. As is the usual case, the federal government needed more money; what funding was collected largely ended up in law firms coffers and not applied to actual hazardous waste site cleanups. SARA became law in 1986, drew upon EPA’s experience in administering the cumbersome Superfund program, and made several important program changes and additions. Most importantly, with this re-formulated version of CERCLA, the protections afforded to commercial lenders and other mortgage holders by the “secured creditor exemption” disappeared like a dream. For the purposes of this question, your environmental professional should understand that SARA (1986) drastically expanded commercial lender and mortgage holder liability under CERCLA and pinched closed the “secured creditor exemption” loophole inherent to CERCLA (1980). For law scholars and other academicians: Connolly, Dennis R., Superfund Whacks the Banks, Wall Street Journal, August 28, 1990, p. A10. Question #2: About what construction year should I be convinced that my building likely has no asbestos-containing building materials (ACBMs) at all? Federal regulations brought the U.S. production of ACBMs to an end (except in special applications) in the vast majority of building materials between 1973 and 1978. Although ACBMs are occasionally found in post-1980 constructed buildings, your environmental professional should know that post-1980 constructed buildings are very likely asbestos free. Question #3: About what construction year should I be convinced that my building likely has no lead-based paint (LBP) at all? Paint containing more than 0.06% (by weight of dried product) lead was banned for residential use in the United States in 1978 by the U.S. Consumer Product Safety Commission (16 Code of Federal Regulations CFR 1303). Most environmental professionals stop looking for LBP in buildings constructed in 1980 and later. 1978 or 1979 are also acceptable answers. Question #4: What structures searched for on all commercial properties during a Phase I Environmental Site Assessment easily represent the greatest single threat to groundwater quality in the U.S.? Underground storage tanks (USTs) and associated petroleum releases represent the greatest single threat to groundwater quality in the U.S. In fact, there isn’t even a close second. Petroleum releases account for over 98% of all subsurface virgin chemical releases in the U.S. annually by volume. Question #5: Which of the following four chemicals would you recommend testing for in the groundwater beneath a dry cleaners? The correct answer is tetrachloroethylene or PCE. Question #6: Which of the following four chemicals would you recommend testing for in the groundwater beneath a gasoline station? The correct answer is benzene. Question #7: Which of the following federal regulations would best provide information on the proper transport, storage, disposal, and overall “cradle to grave” management of hazardous materials in the U.S.? The correct answer is RCRA (1976). Question #8: Under the ASTM standard practice for Phase I Environmental Site Assessments, how long is a Phase I Environmental Site Assessment valid? The correct answer is 180-days (six months). For liability protection under CERCLA, a Phase I Environmental Site Assessment is valid for one calendar year. After one year, the report becomes obsolete. As such, a Phase I Environmental Site Assessment must be conducted within one calendar year prior to purchase of the property. However, under the ASTM standard practice, certain aspects of the environmental assessment, e.g., physical site inspection, relevant interviews, local records search, etc. must be updated or re-conducted within 180-days of the purchase date. As such, the specific question answer is 180-days (six months). As part of your Phase I Environmental Site Assessment, require your environmental professional to include “non-scope” environmental concerns described in the ASTM standard practice such as non-tidal wetlands, lead-based paint (LBP), asbestos-containing building materials (ACBMs), mold, and others. Although not CERCLA liability concerns, these environmental conditions can limit or restrict the use of a given property and represent a potential liability.